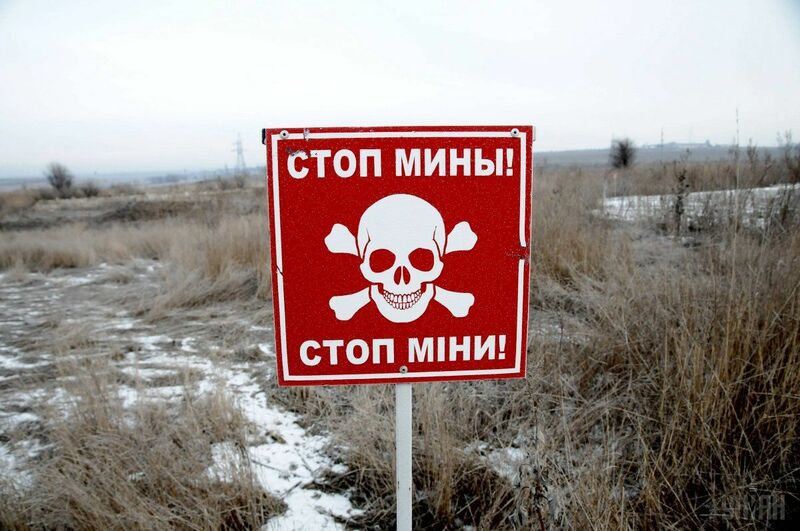 KIEV, Ukraine -- The OSCE SMM first recorded a mine warning sign in Russian, installed some two meters off the road. Russian proxy forces in Donbass continue to brazenly mine the territories near the line of contact, thus endangering Donbass civilians, according to the Ukrainian side to the Joint Center for Control and Coordination of ceasefire (JSCC). According to the OSCE SMM report published on January 26, about three kilometers north of the village of Lysoe (southeast of Luhansk), the patrol team for the first time spotted a mine warning sign in Russian, which was installed approximately two meters off the road. The soldiers of Ukraine Armed Forces, officers of the State Emergencies Service, and representatives of civil and military administrations of Donetsk and Luhansk regions are working hard to bring Donbass back to peaceful life. To this end, they systemically identify, seize, and destroy explosive objects, including artillery shells, mortar shells, grenades, in the area near the line of demarcation of the sides, reads the statement published in the Joint Forces Operation website. Unfortunately, the JCCC notes, it's only the Ukrainan side that puts forward peace initiatives in this direction, while the occupation administration and the armed forces of the Russian Federation are only interested in further aggravating the conflict and worsening the humanitarian situation in Donbass. The Ukrainian side to the JCCC further urges the occupation administration and the armed forces of the Russian Federation to stop ignoring the interests of civilians on both sides of the demarcation line, as well as the environmental security issues in the region and those related to the restoration of civilian infrastructure in the region.